Blinds or shades? Curtains or drapes? What’s the difference? Stop asking yourself the tough questions, and start with the easy ones. What specific jobs do you want your window treatments to do? Style-wise, few choices will lead you astray. Here are some considerations to help shed light on the subject. The sun be a real distraction if you crave darkness for rest or relief. 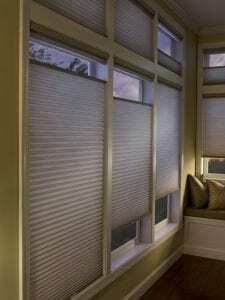 Room darkening fabrics like Atmosphere Fanfare Platinum for Cellular Shades or black out panels like Horizon Charcoal let you flick the switch when you need to unplug. Consider especially for east-facing rooms to avoid that sunrise surprise. We’ve seen what happens to your throw pillows in direct sunlight. It’s not pretty. To protect furnishings and floors from direct sunlight, a fabric with a high “R factor” is recommended. Try Atmosphere Symphony Fog in Sheer Horizontals. The “R factor” is the fabric’s ability to block harmful UV rays and can be as high as 98%. A higher R Factor also means added insulation for warmer or cooler rooms. 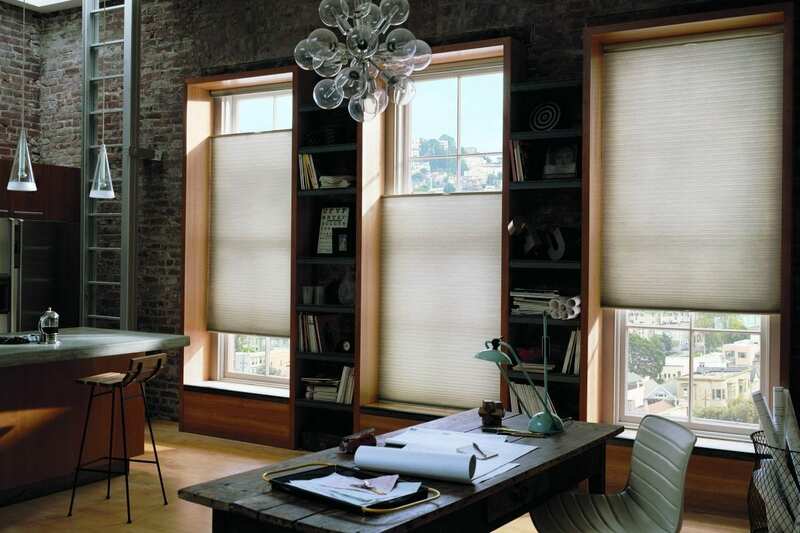 A shade for all seasons, Cellular Shades are incredibly energy efficient. They know the secret for dressing in our climate: layers. 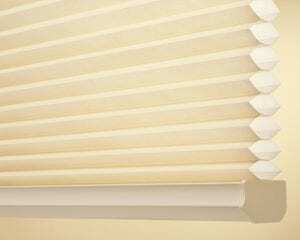 Cellular Shades can be made with one, two, or even three layers of fabric, giving them their ‘honeycomb’ nickname. The air space between each layer (or cell) helps to keep cold air out in the winter, and warm air out in the summer. Want Privacy and a View? That’s not too much to ask. Consider a “Top Down Bottom Up” style, where the top of the blind can be lowered, or the bottom can be raised, to any light or privacy combination you desire. Crop the view exactly as you’d like it, keeping the treetops and cropping the traffic. Consider a motorized system on a timer, to give the illusion that someone is home, even when no one is. There are even apps which will do all the thinking for you. If your wish list is bigger than your budget, consider Basic Faux Wood Blinds which can be custom cut to any width in white or espresso. These offer the best of all benefits at an affordable price, with clean lines that will enhance any décor. Susan Lane, with her partner Sheldon, own and operate the Stephenville Paint Shop. Visit them at 171 Main Street.